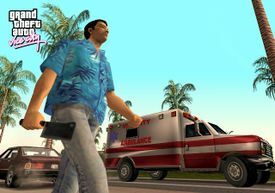 Tommy Vercetti wielding a Meat Cleaver. HUD icon in GTA Vice City. "This carbon steel cleaver can be used for cutting up large bones, pork chops and cartilage. Good for commercial or street use." -Vice City Bureau of Investigation description. The Meat Cleaver is a blade-like tool usually used by butchers to cut slabs of meat into smaller pieces. In Grand Theft Auto: Vice City and Grand Theft Auto: Liberty City Stories, it is used as a melee weapon. Like other knives in the game, the meat cleaver it can damage cars and people and can leave the victim bleeding, leaving a trail of blood drops on the ground. Vice Point, Vice Beach - Behind The Well Stacked Pizza Co.
North Point Mall, Vice Point, Vice Beach - Available to buy from Tooled Up for $50. Washington Beach, Vice Beach - Available to buy from Bunch of Tools for $50. Little Havana, Vice City Mainland - Available to buy from Screw This for $50. The meat cleaver is dropped by a chef during the mission "Back Alley Brawl." Chinatown, Portland - Available in the middle of the shopping alley in Chinatown next to a noodle stand. Some Triads can be seen wielding the meat cleaver. This page was last modified on 20 January 2012, at 03:55.